Stitches n' Scraps: Help me Destash! I'm putting my new Scrapbook/Craft room together, and I don't want to fill it with things that I know I won't be using. I have set up a Destash list on my Facebook page. There are some prices on things or you can make me an offer. 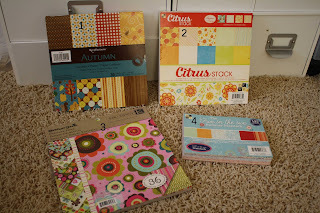 I have Stampin up stamps, paper, new albums, felt embellishments, paper pads, Tim Holtz, Technique Tuesday, etc. If you'd like some cheap supplies have a look!